Crown courts around south London were brought to a standstill today after an outbreak of diarrhoea at one of the capital's biggest prisons. Around 370 prisoners at HMP Wandsworth and dozens of jailers have also been afflicted by the runs. 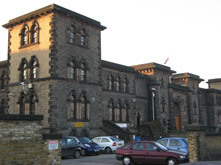 HM Prison Wandsworth is a Category B men's prison. The prison is operated by Her Majesty's Prison Service, and is the largest prison in London and one of the largest in western Europe.